Have you ever had problems in remembering names, numbers, grocery items needed, and other little details such as the location where you placed your car keys this morning? The truth is, we all have our moments of forgetting little bits of information that matters at the exact moment we need them. But did you know that memorization techniques boil down to two basic things? These are ways on how you focus your attention and create a meaning in correspondence to the information or object you store in your memory. With memory techniques, you encourage your mind to be creative while utilizing your innate memory skills. One of the proven memory techniques known today is called the Link Method. 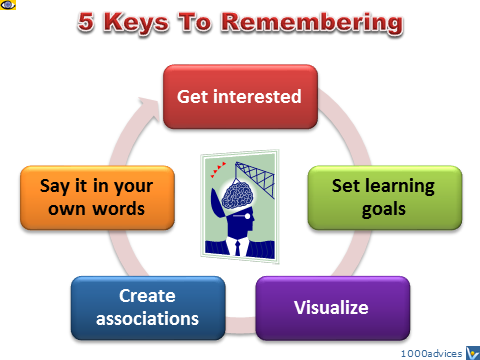 As mentioned above, enhancing your memory skills require you to become creative and imaginative which are considered very strong memory boosters when exercised correctly. Using the Link approach, it has been proven that an object associated to the next on the list is less confusing to do, not to mention the order of the information included are also memorized easier. The list of items to be memorized can easily be remembered no matter how irrelevant they are from one another. With continuous practice and diligence, Link Method allows you to remember things from the top of your head without getting stuck in frustration in the middle of urgency. Now isn’t that a good thing? Of course it is. Let me give you an example. Say you need to remember five items. We can take the items as the following; a cat, rice, hat, pigeon and fence. They are entirely different and have no relevance from one another but remembering these bits of information is a piece of cake with pure Link Method. What you need to do is have your imagination working by starting on the cat. Imagine it as a Siamese cat that eats rice since he’s from Siam. The rice is served in a hat but then, a pigeon comes along and starts to eat the rice. Seeing this, the cat chases the pigeon away and ends up landing in the fence. What you can do in addition to the scene above is to create details for each character. Try to imagine the colors, location and other important details as you construct the scene. Experts found out that the memory skills of a person work very well with colors. However, it is not so good when it comes to shapes. Going back to the scene we’ve created, plus points would go for funnier imagination. Humans respond and capture vivid images that are unique and funny. It may sound crazy but it’s proven to work. Imagination and memory is a good pair that works excellent together. Using it takes less of an effort but requires enthusiasm and willingness. These are just basic factors you can learn out of the entire section of memory techniques. Find out more here. Association Links for Memory Improvement Ваш обозреватель не поддерживает встроенные рамки или он не настроен на их отображение.